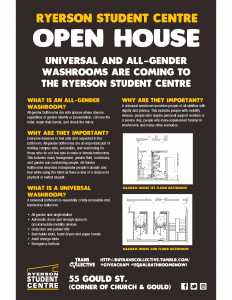 The Ryerson Student Centre (RSC) is conducting renovations in Oakham House and is taking this opportunity to create all-gender washrooms on the first and second floor of Oakham House. In addition, a fully universal washroom is also being created to improve accessibility in this building. The goal of the RSC is to create not only an accessible facility, but a fully inclusive facility that everybody can use. What is an All-Gender Washroom? All-gender washrooms are safe spaces where anyone, regardless of gender identity or presentation, can use the toilet, wash their hands, and check the mirror. Everyone deserves to feel safe and respected in the washroom. 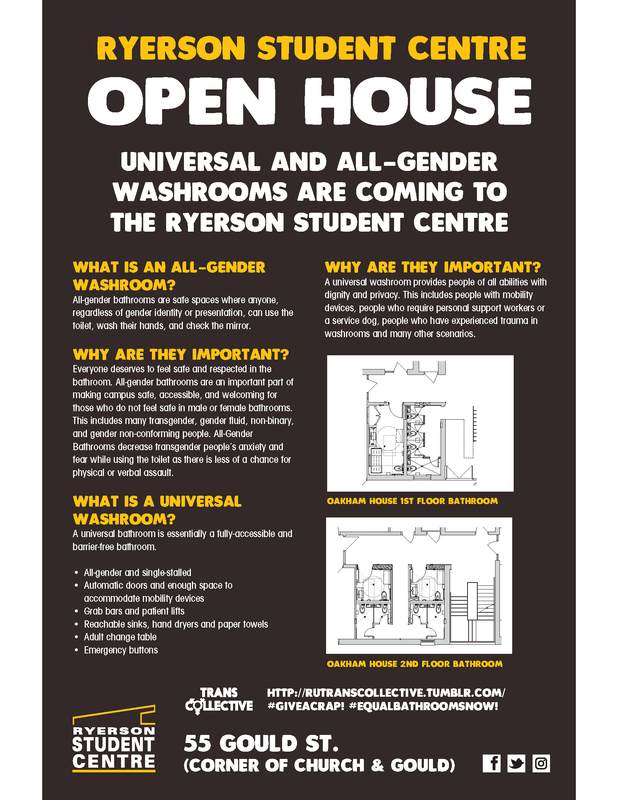 All-gender washrooms are an important part of making the campus safe, accessible, and welcoming for those who don’t feel safe in male or female washrooms. This includes many transgender, gender fluid, non-binary, and gender non-conforming people. All-Gender Washrooms decrease transgender people’s anxiety and fear while using the toilet as there is less of a chance for physical or verbal assault. What is a Universal Washroom? A universal washroom provides people of all abilities with dignity and privacy. This includes people with mobility devices, people who require personal support workers or a service dog, people who have experienced trauma in washrooms and many other scenarios. The RSC is committed to investing in our facility and improving accessibility for all.